Pinnacle is proud to sponsor the Cheyenne Regional Medical Center (CRMC) Foundation 2018 Golf Classic. Go Team Pinnacle! 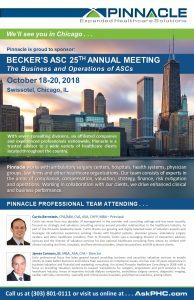 Pinnacle is attending MGMA18 – The Annual Conference, September 30 – October 3 in Boston. Pinnacle will be attending the 2nd Annual National Opioid Crisis Management Congress September 27 and 28 in Washington, DC. Pinnacle is proud to sponsor McDermott Will & Emery’s Healthcare Litigation, Compliance and Investigations Forum in Chicago on September 27th. 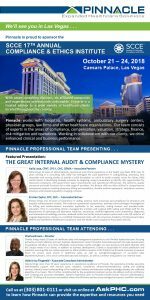 Pinnacle is a proud sponsor of American Health Lawyers Association (AHLA)’s Fraud and Compliance Forum, September 26 – 28 in Baltimore, Maryland. Larry Gray, TeleNeph’s CEO, will be attending American Telemedicine Association (ATA)’s Edge 2018: Re-Imagining Care in a Borderless, Connected World, September 26 – 28 in Austin, Texas.